As you drive across the country, the local lingo for most things will change. Yard sale becomes tag sale. Dinner becomes supper. Sneakers become tennis shoes. The same can be said for what Americans call large trucks. In Texas they call them 18 wheelers. In Virginia they call them tractor trailers. And in California they call them semi trucks. And while everyone understands what you're referring to when you use one of those terms, they don't actually all mean the same thing. A "semi truck" refers to the actual truck, which contains the engine. Semi trucks frequently travel without a trailer. "Tractor trailer" and "18 wheeler" both refer to the combination of a semi truck and its trailer. Together they form the tractor trailer unit, also called an 18 wheeler, referring to the number of wheels on the unit as a whole. To create this map, we compiled a list of the top names for large trucks: semi truck, tractor trailer, 18 wheeler, big rig, lorry, freighter, semi trailer, and trailer truck. Then we ran them all through Google Trends to find out which states searched for these terms more frequently than any other state. We quickly learned that semi truck is the preferred terminology for most of the country, winning 25 states. 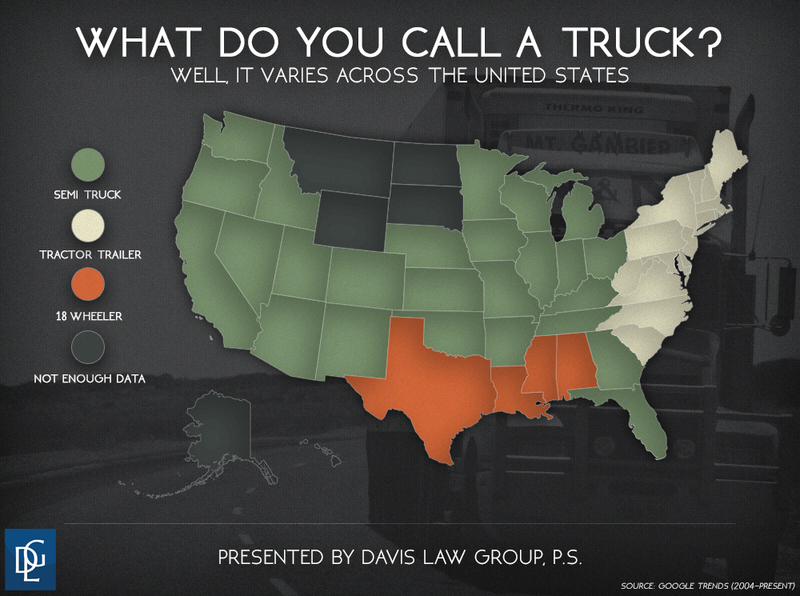 "Tractor trailer" was the second most popular, used primarily in the Mid-Atlantic and Northeast by 15 states. "18 wheeler" is extremely rare throughout most the country, but residents of Alabama, Louisiana, Mississippi and Texas are frequent users of the term. Six states — Alaska, Hawaii, North Dakota, South Dakota and Wyoming — did not have enough search data to return results. That matches with trucking industry research: none of those states are in the top 25 for number of trucking companies. But while there may not be many people searching in those states, consider this: truck drivers in Alaska ($27.04) and North Dakota ($25.49) make more per hour on average than drivers in any other state. The strongest state for semi truck searches was Nebraska. That matches with trucking industry statistics, which show that Nebraska has the highest concentration of truck drivers in the country, with 27.36 drivers per thousand jobs. Iowa, Idaho, Indiana and Michigan were also extremely likely to search for semi truck over any other term. While semi truck is popular throughout America's heartland, it's rarely used in several states. Delaware, Maine, Mississippi, New Hampshire, Rhode Island and Vermont were so strong in their own terms that not enough data could be collected about semi truck searches. Dominated by the Mid-Atlantic and Northeast, this regional term for large trucks is most common in West Virginia, Maine, New Hampshire, Pennsylvania and Vermont. Trucking is a $726 billion industry in the United States, with 7.1 million people employed by the industry. That's 6 percent of the U.S. working population. Truck driver is the most common occupation in 29 states, including Louisiana, Mississippi and Texas, where 18 wheeler is most frequently used to describe large trucks. Texas is a titan of the trucking industry: the state employs 182,370 truck drivers, most of anywhere in the country. Searches for 18 wheeler was also prevalent — but not the primary term — in some other southern states, including Arkansas, South Carolina, Georgia, and Tennessee. Among other terms, big rig is the most common phrase to be used to describe a large truck. California, Wisconsin, Texas, Arizona and Georgia are most likely to use the term. Worldwide, big rig appears to the preferred term in Canada, Brazil and most of Europe, outranking semi truck. Lorry is the term used in Britain to describe a "motor vehicle for transporting goods." Lorry is also used frequently in Sri Lanka. Davis Law Group, P.S., was founded in 1994 by attorney Chris Davis. For more than 20 years, our experienced attorneys have represented people who have been badly injured in trucking accidents. Our lawyers have recovered millions of dollars in settlements on behalf of trucking accident victims and understand what it takes to conduct a proper investigation into a case so that our clients receive the best possible outcome. 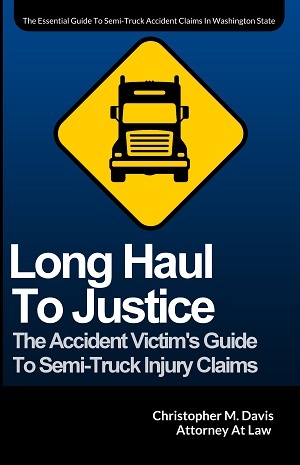 RELATED: Click to view a brief list of the featured truck accident cases handled by Davis Law Group. If you or a loved one has been seriously injured in an accident involving a large truck in Washington state, contact attorney Chris Davis and the team at Davis Law Group at (206) 727-4000 to schedule your free legal consultation.